We call SMU the Ponies for a couple of reasons. First, of course, the old “Pony Express” backfield of Eric Dickerson and Craig James of the early 80’s. Big-time players who put SMU on the map, pre-major probation era. 1987, SMU became the first and, currently, only school to have its football program given the the NCAA’s “death penalty”. The program was terminated for the 1987 season because the university was allegedly making approximately $61,000 in booster payments from 1985 to 1986. It later emerged that a “slush fund” had been used to pay players as early as the mid-1970s, and athletic officials had known about it as early as 1981. The death penalty, while harsh, also worked. SMU hasn’t been to a bowl game since 1984, and have had just one winning season since the penalty crippled the program. But while the old gray mare ain’t what she used to be, there is some strong history at SMU. Don Meredith, Doak Walker, Craig James, Eric Dickerson, etc. Big names, sure. Just that whole cheating thing more or less sunk the ship. Anyway, not to belittle the upcoming opponent, but, when looking at 2008, “ponies” seems appropriate. 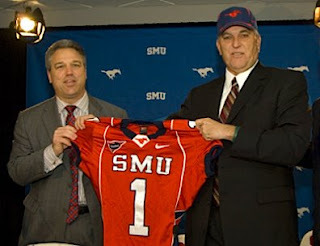 In June Jones’ first year at the helm after getting off the Hawai’ian islands, his SMU Mustangs took a 1-11, zero-conference-win BATH in C-USA. We thought WSU ’08 was bad? One look at what SMU went through and you see it was just as bad….if not worse. LAST YEAR: 1-11, 0-8 in-conference. Sounds a little familiar? They did beat Texas State in a 47-36 shootout, but otherwise they goose-egged it for ’08. Now let’s get real here. SMU pretty much stunk in ’08, rolling out a brutal season in their first year under Jones. But there might be at least some promise in that 1-11 mark. They did hang in there against bowl teams like Houston (44-38), Memphis (31-26) and Tulsa (37-31). But hey, 1-11 is 1-11. Not quite as bad as 0-12, but, uh, still awfully bumpy. The bad news is that 1-11 was all too familiar to the SMU faithful. Why? Because they went 1-11, including 0-8 in conference, in 2007! A lone win over North Texas saved them from a defeated ’07. It’s been some tough times down SMU’s way the last couple of years. FANS ARE: Wondering exactly what the fuss was over June Jones? THIS is the guy who led Hawai’i to all those wins and bowl games? This is the guy they paid $10 million for, over the next five years, to get things moving? But really, it’s not THAT bad. 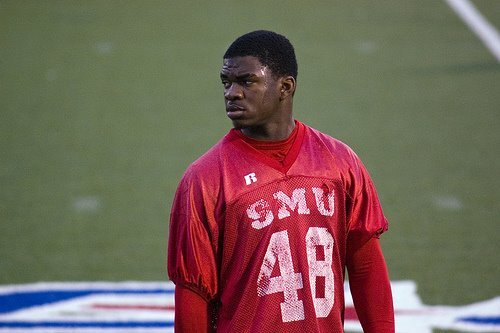 It appears many SMU faithful understood Jones was stepping into a very difficult situation. After all, he was essentially starting over with a very young squad in ’08. Very much a “flip that program” deal that WSU fans are all too familiar with, year one was a major overhaul in several different areas for SMU. Jones and company were simply trying to implement their entire system, on and off the field. And besides, SMU was only returning 10 starters last year – five on offense, five on defense – so over half the team on both sides of the ball had new faces to break in. When you have an offense that is a radical switch to the run-and-shoot, it’s not exactly the simplest of systems for pretty much everyone on offense. Major speed bumps in year one were expected, and that’s exactly what they got. OFFENSIVE SYSTEM: Run-n-shoot, big-time. And definitely more shoot than run? Jones brought the system with him to Dallas last year, and it showed in their stats, where they attempted 476 passes vs. only 217 rushing attempts. OFFENSIVE RATINGS: 98th in total offense, averaging 314.3 yards per game. The passing game was alright, averaging 272.9 yards per game. But the running game? Ouch. Not only did they only attempt 217 runs on the year, but they only averaged 41.4 yards per game, on just 2.3 yards per carry. June Jones has never been a big run guy in the run-n-shoot, but wow, just 41 yards per game is just about as tough as it gets. TOP OFFENSIVE PLAYER: QB Bo Levi Mitchell. The true frosh started from day one of the ’08 season, and didn’t disappoint. Even though the overall record wasn’t there, the upside is apparent. 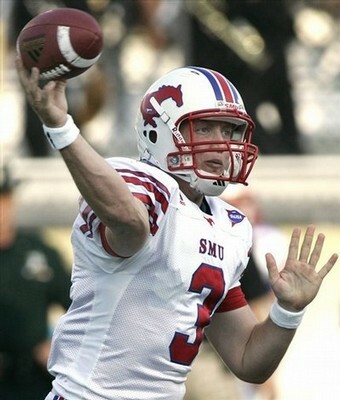 Mitchell racked up 2865 yards passing, with 24 TD passes to boot, good for third-most in single season history at SMU. He had five games of at least three TD passes, and four games in which he threw for at least 300 yards, which is 2nd all-time in SMU history for 300+ yard games in a season. But he certainly wasn’t perfect. He did make an awful lot of rookie mistakes, including 23 INT’s and a completion percentage of 57.6 percent. A big key is going to be Mitchell’s health. Mitchell is strong, but isn’t the biggest QB in the world, listed at 6-1, 201. He injured his shoulder late in the season vs. Memphis, and after the injury, would throw four int’s with one TD pass in his last two games. But the potential is there in a system that appears to fit him well. He’s also regarded as a real student of the game, watching countless hours of tape on Colt Brennan, looking for ways to get better and master a tough to “pick up and play” offense. DEFENSIVE SCHEME: While listed as “multiple”, they were mainly a 4-3 defense. But now they are purely a 3-4 scheme, based on their latest spring practice session and depth chart. DEFENSIVE RATINGS: Pretty much a nightmare last year. SMU was 119th in the country in total defense, giving up 479.5 yards per game. That number was slightly better than what happened in ’07, where they gave up 498.7 yards per game. Still, it was pretty much the bottom of the barrel in defensive ratings for SMU. Teams averaged almost five yards per carry (4.9) against the defense. TOP DEFENSIVE PLAYER: LB Youri Yenga. While fellow linebacker Pete Fleps had more total tackles last year (106), I will go with Yenga as the best defensive player on SMU’s roster. Yenga had a breakout ’08 campaign, when he had 73 tackles, as well as leading the team in tackles for loss (10.5) and sacks (6.5). This year he will be a weakside linebacker in the 3-4 after playing some defensive end last year, and he should be able to attack the line of scrimmage as an outside rusher. Undersized as a defensive end but just right as a weakside ‘backer at 6-1, 223, he could be a perfect fit in their linebacker corps. And on a defense that recorded just 18 sacks for the entire ’08 season, Yenga was roughly better than 1/3rd of the entire team sack totals. Yenga also led the team in QB hurries (4), plus a team-high in forced fumbles (3). He even blocked a couple of kicks. Simply put, Yenga is the top player on the defense and must be accounted for on every snap for next season. 1) How does the O-line look? Can they protect Mitchell and keep him healthy? With eight starters back on offense, you would think things will be fine. But the SMU offensive line is awfully young. Four of the five projected starters for next year are sophomores. However three of them got some significant game experience last season, so it might not be as bad as it sounds. Still, that’s a lot of youth up front, and there could still be some significant growing pains ahead. 2) Sure, Mitchell had a big ’08 season. But will he suffer from the dreaded Sophomore Slump? It doesn’t really look like it. As stated above, yes, the line is young, but they do have some game experience under their belts. But the best thing for Mitchell is that his top two WR’s are coming back for ’09. Aldrick Robinson is a big-play guy at WR, with a team leading 1,047 yards receiving and 11 TD catches, all as a sophomore last year. But he’s not alone. Emmanuel Sanders is back as well, and all he did was reel in another 958 yards receiving of his own, with nine TD catches. 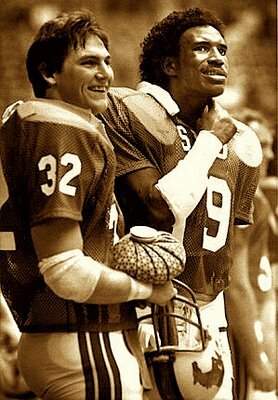 Add Robinson and Sanders together, and you are talking about 2000+ yards and 20 TD catches between them. When a QB has experienced weapons like that coming back, he should be just fine in ’09. 3) But will the defense stop anybody? ANYONE? Not an easy question to answer. Eight starters are back, and as they always say, experience is the best teacher. There are some good individuals coming back, with Yenga and Fleps at linebacker. And they are making a permanent switch to the 3-4 defense next season, so it might be a better fit given their relative strength at linebacker. But of those eight starters, only three are seniors. So they will still be somewhat young. And you are also talking about a unit that was pushed around for most of the last two seasons. This is one of the worst overall defenses in the country over their last 24 games, coaching changes be damned. To suddenly turn it all around might be far-fetched, but with some major lessons learned by some key individuals last year, 2009 could see some solid steps forward. WSU FOOTBALL BLOG SEZ: SMU is going to be an interesting challenge. A lot of experience back, and they will be eager to taste some success after such a miserable last couple of seasons. The offense should be pretty familiar to WSU, after seeing Hawai’i’s version of the run-n-shoot the prior week. SMU opens with winnable games vs. Stephen F Austin at home, and then at UAB on 9/12 before making the trip north to Pullman. This is a game between two programs that have clearly seen better days. And, quite frankly, both teams are probably looking at the schedule right now and thinking “that’s one we can get.” Even though coaches NEVER look ahead, right?? But it’s also fair to say that, looking at the schedules ahead for both teams? They sure better get this one. Not to get all gloomy, but, whoever loses here may not have many wins left in their respective schedules. That’s it for SMU on a Tuesday. Enjoy your day, and GO COUGS! You are currently browsing the archives for the June Jones category.